Soil-borne fungi Pythium aphanidermatum causes damping-off of cucumber, coriander and other economically important plants in India and presumably in many other countries. The objective of the present investigation was to characterize the pathogen morphologically in vitro and to confirm its molecular identity by the sequence of ITS region of rDNA. 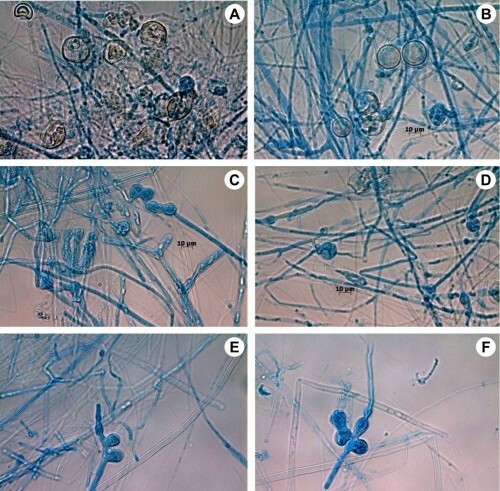 P. aphanidermatum was isolated from soil and cultured in PDBbroth and PDA solid media. The characteristic of growth was monitored and the reproductive structures were analyzed. Hyphae were grown with a daily increment of 2.5-3.0 cm on PDB. Sporangia were swollen, multinucleate and usually measure 10-50 μm in diameter. Oogonia were found mostly terminal, spherical, 22-27 µm in diameter. Fungus was also characterized using molecular methods based on ITS-PCR. The ampliﬁed sequence was compared with the available sequences in the NCBI GenBank. The sequence showed 99% similarity with other species of Pythium. Based on the morphological and molecular characters isolate was confirmed as Pythium aphanidermatum. The isolation, morphological characterization and sequencing of ITS region of rDNA will add knowledge to the scientific community for proper identification and in-depth research on the management of this plant pathogen. Fig. : Vegetative and reproductive structures of Pythium aphanidermatum (Edson) Fitzp. : A–B, Oogonia; C–D, Inflated filamentous Sporangia; E, Sporangia with laterally placed Papilla; F, Papilla was developed at the apex of Sporangia.